Benneta Betbadal was born in Iran in 1969. She fled to America at the age of 18 to escape Islamic extremism and the persecution of Christians that followed the Iranian Revolution. Benneta initially settled in New York City, eventually moving to California and marrying her husband, Arlen Verdehyou, a police officer. 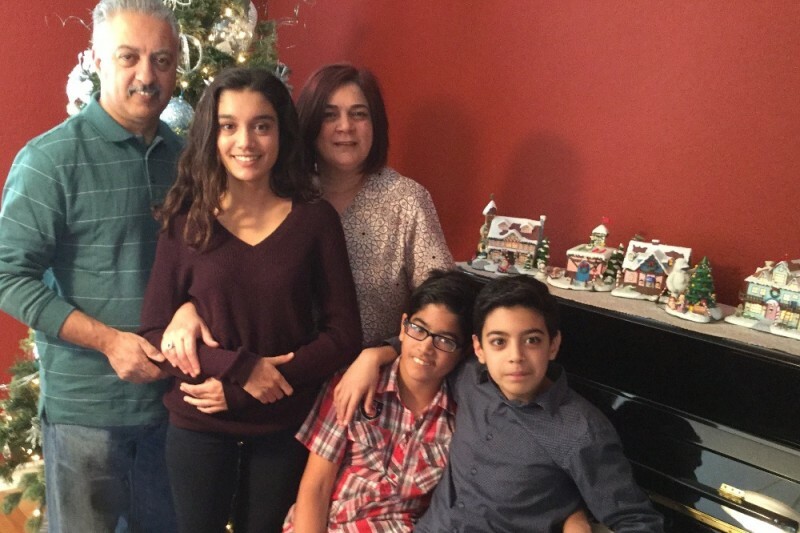 They moved to Rialto, California and had three children, now ages 10, 12, and 15. Benneta left the house Wednesday morning, excited to attend her Department's annual meeting. It is the ultimate irony that her life would be stolen from her that day by what appears to be the same type of extremism that she fled so many years ago. This is fund will be used to benefit Benneta's children, as they and the family adapt to life without her. My husband and I own Pull Up A Chair Event a Rentals and would love to help with rental needs for any services that may happen in the coming weeks. We are heartbroken for the families and want to help anyway we can. As an Assyrian mother, my heart aches deeply for your family. My parents too fled Iran for a better future. Your mother sacrificed everything so that her children would have the freedoms she did not in Iran. You 3 children are your mothers legacy. I pray for the pain won't hurt so bad very soon. My family is grieving with yours. Is there any information regarding her memorial? My family owned a local restaurant and we would like to pay our respects to Benetta and her family. Thank you! As a Christian who has lived around the world.. I know that it is easier for many Americans to take our Freedom of Religion and Speech here in the USA for granted.. I remember the 1979 Iran Revolution ( I was in the Mediterranean in Nov 1979 when the US Embassy was overthrown) and I have met Iranian Jews and Christians over the years here in the USA. I did not specifically know this family.. but this is an attack on America, and as a Christian.. an attack on the family of God. My prayers are with you. Please find the joy in this season as best as you are able and remember her life and not her death. Psalm 91. May you be comforted by God's blanket of peace, during this difficult time. I will be praying for your family as I receive the Holy Eucharist this weekend, and throughout this Advent season. Please let me know if you, or your family members would like someone to pray with you. I work at your daughters school, if she ever needs anything I'm close by. Blessings. In this terrible time it is so heart warming to see all the love for this family.. May we all continue to love one another.. And pray for peace and love.. May your beautiful mother rest in the arms of Jesus. My heart goes out to Arlen and the kids. Benneta was such a kind woman. Please keep us informed of a memorial service. My heart goes out to Benneta's family and friends. Thank you for setting up this account to help them. If the family needs grief therapy they should definitely use the funds for that too. This is all even more tragic when one realizes that she came here to escape persecution. Bless your heart and theirs. Praying for your family. I was privileged to talk with Bennetta a few times and knew she was a sweet woman who loved her children. I am confident she is in the arms of Jesus...praying for His peace and comfort. Arlen my deepest condolences to you and your family. It breaks my heart to hear this terrible news. Arlen, my condolences. Not sure you remember me but my prayers are with you and your family. I want to thank the deputy who started this and all he has done for the family. Thank you for all the updates. You are a true Christian and may God bless you and your family. And may God give Arlen and the kids strength while going through this grief and heart breaking tragedy. Im so sorry for your loss and your prayers has being sent..
Dear Benneta's family, may all these caring comments and support help to bring comfort to each of you. My heart goes out to you, as in the last year I lost both my mother and my father; but not to such a heartbreaking circumstance as a terror attack. I will be praying that each of you will carry the torch of Benneta's faith and love, giving all you cannot handle to the Lord, letting Him carry you every day. Sierra Clayborn... im Arlens cousin and this is NOT a scam. Please dont spread rumors and this is not a time or a place to joke and say this sort of thing, Please get your facts straight! And i guarantee you if this was a scam Arlen and his relatives would be the first to sound the alarm. And thank you to all supporters and well wishes. This is a tragedy not just for the family but for all Americans. God bless all families involved. Benneta was a loving mother, wife,cousin and friend to many people. She will be dearly missed and remembered by all. If you are in contact with any of the families of the victims of the San Bernadino Christmas terror attack please pass this information on to them. For too long those Islamic leaders and “scholars” have inspired others to undertake terrorist attacks and been insulated from any responsibility for those attacks. I would urge families of the San Bernadino terror attack victims to seek to file wrongful death lawsuits naming those who inspired the San Bernadino terrorists including “Islam Online,” Al Basheer Publications and Translations (a Colorado LLC), Saudi royal family and crony Homaidan Al-Turki, the Denver Islamic Society, and its principals and registered agents, other entities connected to Awlaki, perhaps San Bernadino area Islamic institutions, and even Youtube. As a former paralegal and often successful pro-se attorney I am convinced that all of these entities and individuals are vulnerable to wrongful death actions due to the following circumstances. Remember in a civil case a preponderance of the evidence is sufficient, reasonable doubt only applies in criminal cases. In an article entitled “California massacre links back to influence of al-Awlaki” which ran in Washington Post on December 19, 2015 and was reprinted in the Denver Post it was reported that the San Bernadino terrorists were inspired to carry out their attacks by speeches, tapes and/or CDs made by Islamic “scholar” and Denver Islamic Society imam Anwar al-Awlaki. The terrorists were able to view these speeches, etc., despite the fact that Awlaki was killed in a drone strike in Yemen in 2011 due to their proliferation by Al Basheer, Islam Online, YouTube and others. Al Basheer Publications and Translations LLC was Awlaki’s primary publisher. Al Basheer’s principal is Homaidan al-Turki who is also the founder of the Denver Islamic Society. Al Basheer’s website routes to the “Islam Online” website. On the “Islam Online” website speeches, tapes and CDs from Awlaki continued to be available as of July 31, 2016 and in all likelihood are still available to impressionable would-be terrorists. Despite the fact that they have been informed that Awlaki’s tapes have been used to inspire terrorists, Youtube continues to host a massive amount of material from him including one series that is 168 tapes long. I would urge the families of the San Bernadino terrorist attack to contact local attorneys with this information. If you cannot find an attorney brave enough to take the case, please message me and I will get you sufficient information to pursue the case acting as your own attorney, (pro per in California).